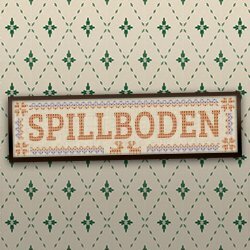 The pixel art aesthetic has proved very popular for iOS games, evoking an earlier era of gaming. Here the main character plays on the idea of being made of pixels, the art style rendering the cat as a very boxy shape. But how does it play? The aim of the game is simple. 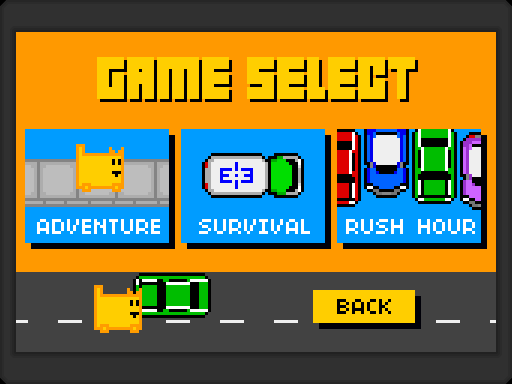 Box Cat must destroy the many cars and trucks by running into the side of them in one of three game modes – Adventure, Survival and Rush Hour. Adventure has an overall time limit and extra time is earned by completing levels. There are also a series of objectives to complete, unlocking extra cats (with two cats available as in app purchases). 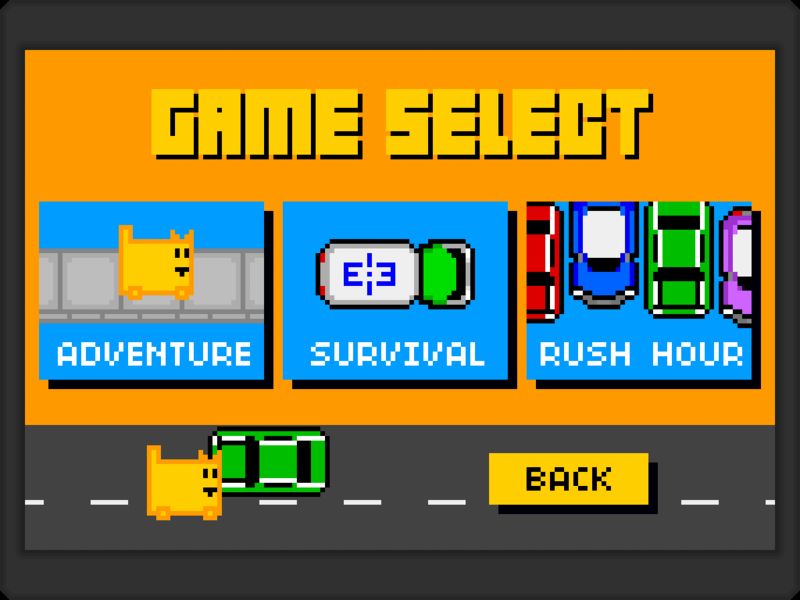 Survival means the player only has three chances (a chance lost when a car is missed), and Rush Hour has a strict time limit to earn the highest score and combo. To help the cat, birds flying by carry extras. These include clocks for extra time and blue coins that allow the cat to take more damage. Collecting three gold coins doubles the size of the cat, making it even more destructive. There are three ways to control your cat. Buttons give on-screen buttons – left and right, and the Dash button. To dash, the button is held to charge the power and then pressed to unleash the powerful attack (most often used to destroy the large boss vehicles at the end of each adventure level). Smashing into a big yellow taxi fills the dash bar automatically, making it easier to dash. Tilt controls still have an onscreen dash button, while the touch option allows you to swipe and hold. The game is also iCade and Joypad compatible. 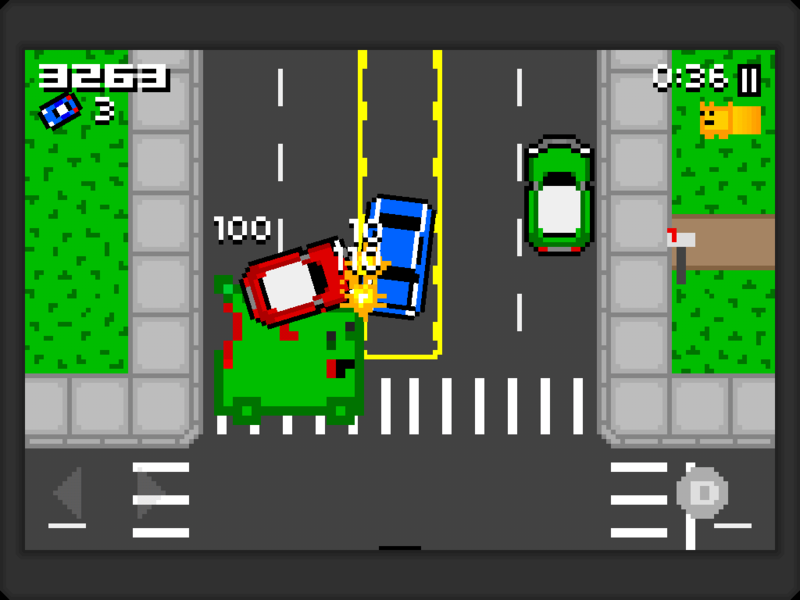 The onscreen information is concise, showing the time left and the number of vehicles required to complete the level. 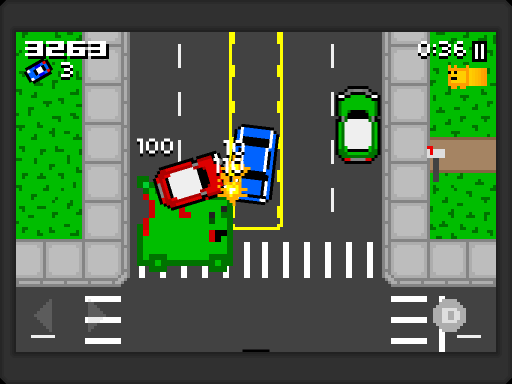 Also essential are the coloured bars that appear at the top and bottom of the screen, indicating where and what type of vehicle is about to enter play. The overall look and feel of the game is excellent, the bleeps and blips of the chiptune music complementing the pixellated graphics. There is variety in the backdrops, from snow-covered parking lots to the busy bridge. One clever touch is the way the whole screen rotates to let the cat cross the bridge; a tricky effect to achieve on an 8-bit processor but doubtless easy on iOS. The enemy vehicles are all nicely styled and have distinctive colours (essential for certain objectives, where you have to hit a particular type). The extra cats all have a distinctive character and are worth unlocking through extended play. Subtle touches that work include the billboards giving playing tips and the way the car headlights switch on as time runs down. For some, the attraction of the retro style created by Rusty Moyher will be limited but the game does offer solid and demanding gameplay – with the objectives in Adventure mode increasing in complexity to match the player’s progress. Earning combos and setting high scores will draw the player back. From personal preference the onscreen buttons were the easiest method for controlling the cat on an iPad, but experiences may differ for others. In short bursts this is a lot of fun, making it ideal for mobile gaming. It has been briefly offered for free, but at £1.49 it is still good value. Cat lovers and retro fans should snap it up.